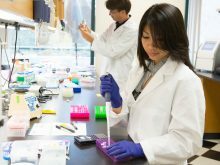 Crinetics Pharmaceuticals, an early stage San Diego biotech developing specialized biosensors for drug discovery applications, says it has signed a collaboration agreement with the Ferring Research Institute, the peptide research center established in San Diego by Ferring Pharmaceuticals. Last month, when Crinetics got a small business research grant of nearly $238,000, the startup said its technology is focused on developing biosensors that utilize a family of receptor molecules on cell walls called G protein-coupled receptors (GPCRs). The biotech says it’s own work is focused on studying endocrine GPCRs that can be used in assays for drug molecules, allowing researchers to rule candidate drugs in or out at an earlier stage and thus potentially speeding up pharmaceutical R&D. In its statement yesterday, Crinetics says it will apply components of its GPCR Dynamics assay platform to a Ferring proprietary drug discovery target. Financial terms of the agreement were not disclosed. Stephen Betz, a Crinetics scientist and spokesman, said no further details would be released about Ferring’s drug target or the agreement itself. Based in Saint-Prex, Switzerland, Ferring Pharmaceuticals specializes in developing drugs in the areas of urology, endocrinology, gastroenterology, gynecology, and fertility.